My quest to find out how to get rid of eczema naturally started about one year ago. For the first time ever in my life, I had an encounter with eczema. As a matter of fact, it was my first skin problem of any type – I really didn’t even have pimples as a teenager! Eczema first hit on my hands and hit hard. It began on the palms of both hands. I thought it was some type of allergic reaction. Most of my products are natural and “clean”. Nevertheless, something was causing my hands to be a shredded mass of raw skin! 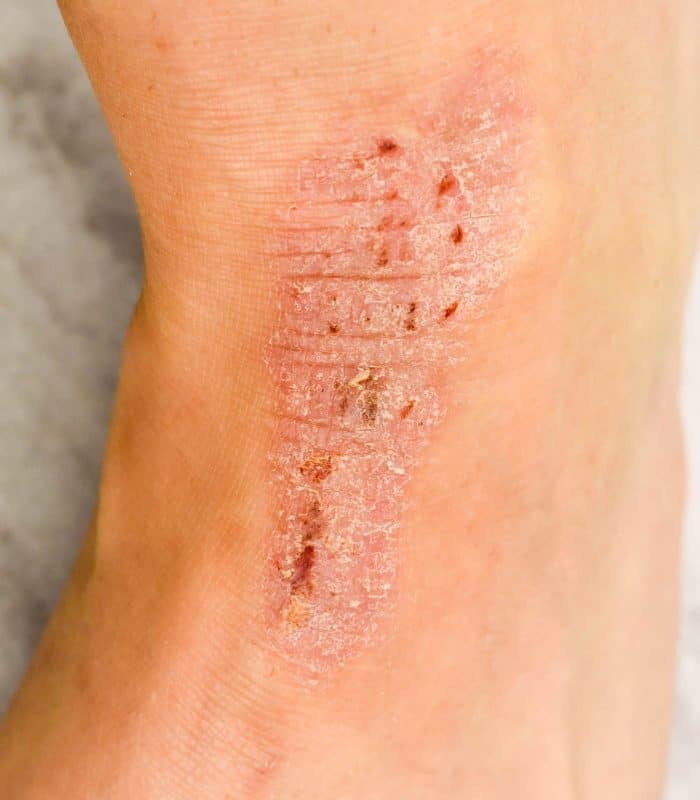 Slowly, the eczema began to break out in new areas. The top of my left foot, the inside bend of both elbows, the base of my neck, all were affected. Would it ever stop? I felt totally helpless! By this time, I had been to a traditional medical doctor looking for relief. Any relief from the incessant itching would be welcomed – or so I thought! Reality hit me in the face when, all the doctor had to offer were steroids. Now, I have been well acquainted with steroids and the side effects and havoc they can wreak on your body. With a teenage diagnosis of rheumatoid arthritis that was alleviated by the GAPS diet, I have been on plenty of steroids. They affected my bone density and as a result, I was diagnosed with osteoporosis at an early age. This was also helped with the GAPS diet. You can see GAPS – My Experience and Reverse Osteoporosis Naturally for more information about it. So began my research to find out how to get rid of eczema naturally. 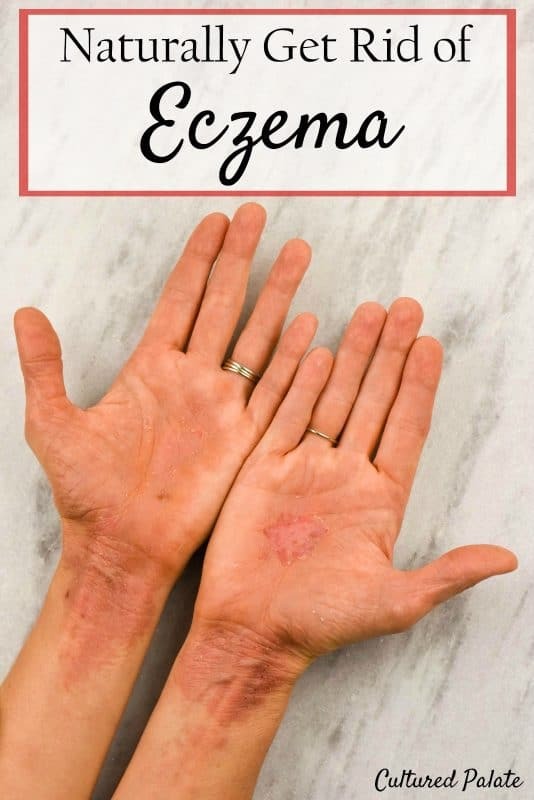 According to the NationalEczema.org, eczema is actually the name of a group of conditions that cause the skin to become red, inflamed and itchy. To my surprise, over 30 million Americans suffer from some form of eczema. 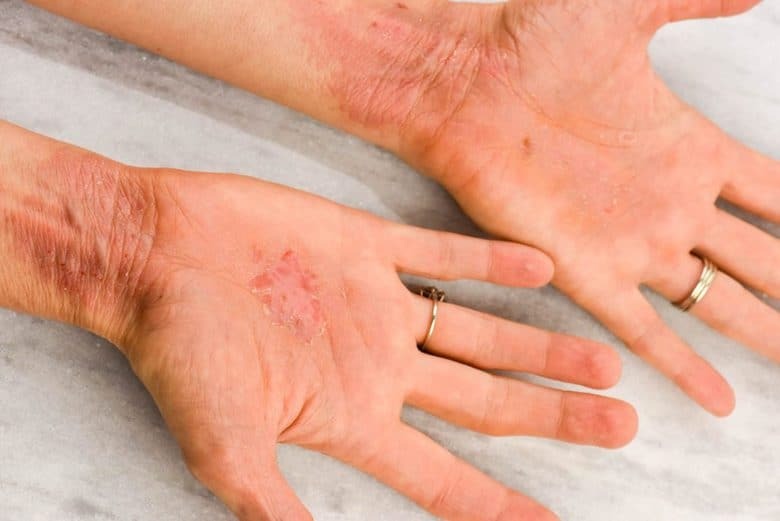 Eczema affects people differently and can look different on each person. One common factor, though, is the itching. I can tell you from experience that it is terribly itchy! In fact, there is an awful itch-scratch cycle that I have experienced. The itch is so bad, the skin becomes even more inflamed and you scratch yourself until you bleed. NOT FUN! The following symptoms are the most prevalent. You may have one or two of the symptoms or more of them. Again, it expresses itself differently for different people. There are many thoughts as to the cause or causes of eczema. Here are what I consider to be the most reliable found at National Eczema Association. 1. Autoimmune Disease – An outbreak of eczema is always accompanied by activation of the immune system according to Healthline. 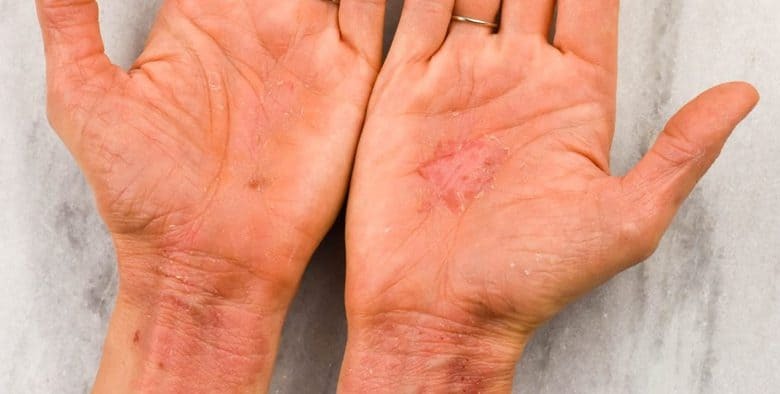 A new study has shown that a drug which targets and blocks the activity of two immune proteins that increase the body’s ability to fight infection helps patients with eczema. Unfortunately, as with other autoimmune diseases, the body mistakenly begins to fight and attack itself. In the case of eczema, the body attacks its own skin integrity and causes an autoimmune response. Interesting – I had already suffered from rheumatoid arthritis which also is an autoimmune disease. But, now, instead of attacking my joints, my body was attacking my skin! 2. Stress – Stress to the body has a detrimental effect. While it may not be a direct cause of eczema, it decreases the body’s immune response and can make the symptoms worse. It can also allow it to express itself when before, the body was able to handle the demands placed upon it. In an already compromised immune system, stress may cause the body to succumb to illnesses, viruses and bacteria. Mononucleosis, which I came down with a few months after my eczema first broke out, is a good example of this. 3. Allergic Response – Allergies can also be associated with eczema. Many sources refer to these as triggers which is anything that causes eczema symptoms to worsen. Most typically, this can be something that you come into contact with like, soaps, lotions, detergents… Food allergies may also trigger symptoms. Common food allergies include dairy, eggs, nuts and seeds, night shade vegetables (like eggplant and tomatoes), and wheat. Healthline published that new study proves for the first time that eczema is an autoimmune disease. The study was published in the Journal of Allergy and Clinical Immunology. My light bulb moment came when I realized that eczema has an autoimmune connection. Rheumatoid arthritis also has an autoimmune element. It is interesting that while I have been free for several years of rheumatoid arthritis, I am now suffering from another autoimmune problem – eczema – HMMMM. I am blessed to live a simple life. But, I do tend to burnt the candle at both ends! I have often jokingly said that if I did not have to sleep, I could get so much more done! In the months prior to my first eczema flare, I had been staying up well after the children were in bed. To be honest, into the wee hours of the morning. I could just get so much done with the quiet, uninterrupted time. I didn’t realize the harm I was doing to my body. According to webmd, sleep deprivation can compromise the body’s immune system, cause heart disease, attacks and failure, irregular heartbeat, high blood pressure, stroke and diabetes. Lack of sleep can also make learning difficult, affect your memory and cause weight gain. After my light bulb moment, a friend recommended a local integrative doctor in our area. He is a medical doctor who practices healing-oriented medicine that looks at the whole person. He has been a great help and helped me identify 4 areas to concentrate on. Please remember, natural solutions can take time, after all, you did not get in this shape overnight and it will most likely take longer than overnight to resolve your condition. I am in no way attempting to give medical advice but I do want to share what has worked for me. If you are not familiar with the GAPS diet, here is a GAPS Review. I had amazing results with my rheumatoid arthritis and my osteoporosis as a result of the GAPS. Once again, the GAPS diet has given amazing result and I have moved through the introduction diet and into the full GAPS diet. If you want to start the GAPS diet, I encourage you to read the Gut and Psychology Syndrome. I also have a FREE printable to help you keep steps of the introduction diet straight – GAPS Intro at a Glance. I keep this on my counter for quick reference. Note: The GAPS diet is meant to be a diet for a period of time to allow your body/gut to heal. According to the author of the book, it is not intended to be a life-long diet. After getting off the diet, you will probably be more mindful of what you eat but just not so strict. Here is the Gallbladder Cleanse that I use and that the doctor recommended that I do this every other week for two months or so. It really made a difference. So, I do the cleanse, skip one week and do it again the following week – this cycle continues for 2 months. Why in the world would this help? Here is a reference sheet from Allergy Research Group, Bitter Brown and Beneficial, that links the importance to bile and skin integrity. Update: This article is no longer available online but here is an excerpt. Bile is a dark green to yellowish brown liquid produced by the liver. The gallbladder stores bile and it aids digestion. Bile acids are actually steroids derived from cholesterol. Bile acids are amazingly beneficial for a variety of conditions not just digestion. It is now greatly appreciated that bile acids are more complex than mere detergents, and should actually be viewed as steroid hormones. Like many other steroid hormones such as neurosteroids and glucocorticoids, bile acids are synthesized from the conversion of cholesterol to various bile acids. Did you catch that? They are talking about gut bacteria! The GAPS diet focuses on getting rid of harmful gut bacteria and replacing it with beneficial bacteria!! Somehow, the gallbladder cleanse and bile salt supplementation also affect gut bacteria. Even being a nurse, I find the technical medical lingo to be a lot to wade through! The article referenced above, mentions a drug that turns out to be synthetic and VERY expensive. So, I found a natural supplement from Jarro – Bile Acid Factors. I have been taking these according to the bottle instructions. Aim for 7 – 8 hours nightly. I am now much more careful to make sure to get to bed at an hour that allows me to get a full night’s sleep. This is difficult but important. Especially during times of an acute attack, more sleep is even better to allow your body to heal and recover. To this point, I am following the 4 steps above and have great relief. Is it completely gone? No, not yet but there was an improvement within 2 weeks. It is now amazingly better! I no longer have hands that are shredded and bleeding. I no longer wake myself (or my husband) up at night scratching the itch that never seemed to stop! As with any natural solution, it takes time. It takes time for the body to heal – really heal and not just treat symptoms. I am excited about the improvement and am confident that in time, my eczema will be healed completely. What have you used to get rid of eczema naturally – or not?